Amb. Ryan Crocker, right, accompanied by Gen. David Petraeus, testifies on Capitol Hill, Apr. 8, 2008. No one should doubt that Iraq is sliding back towards the abyss. Already a resurgent al Qaeda in Iraq (AQI) has killed more than 5,000 civilians in 2013, making it the worst year for violence since the dark days of 2006-7, when it took 140,000 U.S. troops to defuse a sectarian civil war. A new AQI branch, the Islamic State of Iraq and Syria, has captured territory in neighboring Syria, drawing more than 10,000 jihadists to its banner and threatening to export that country’s sectarian strife to the wider region. Meanwhile, a political impasse in Iraq lasting more than two years continues to alienate the Sunni minority, further stoking sectarian tensions. Defense One: Do you think al Qaeda in Iraq has a second chance to plunge the country into a sectarian civil war? Crocker: It’s unquestionably trying to do so with these incredibly lethal and appalling attacks, mostly targeting Shiite civilians. I’m also worried that AQI has been targeting the Sunni leaders behind the Sunni Awakening, which was critical in reducing Sunni support for the group. That violence is exacerbating ethno-sectarian tensions that already existed in Iraq. Thankfully al Qaeda’s tactics have not yet reignited the level of sectarian brutality and bloodshed we saw in 2006-07. If a way is not found to stem the violence we’re now seeing, however, Iraq will reach a breaking point. That would have very severe consequences for Iraq and the region. Defense One: Is the increasingly sectarian conflict next door in Syria stoking that violence? Crocker: Yes. We should be very worried that in addition to destabilizing Iraq, the Islamic State of Iraq and Syria has now established a base of operations and sanctuary in Syria. Occupying Arab territory has long been a dream of al Qaeda, and it will likely use it to not only plan and launch operations in Iraq and Syria, but also overseas again. So, the stakes involved in Iraq and Syria are potentially huge for the region and for the United States on multiple levels. Defense One: Maliki will not only ask President Obama for weapons such as F-16 fighters and Apache gunships to fight the terrorists, but apparently he would like U.S. counterterrorism advisers and intelligence experts to return to Iraq. Should Obama say yes? Crocker: I absolutely believe that the United States should supply Iraq with the increased counterterrorism support necessary to deal with the al Qaeda threat. We have a playbook for this, and it doesn’t require Apache helicopters or lots of troops. But it does require good Special Forces and intelligence support. As David Petraeus and I discovered when we were in Baghdad, you can’t achieve progress on the political front until you improve security. So priority number one should be working with the Iraqis to figure out how al Qaeda is moving men and material, what rat lines are they using, where are their safe houses and how can we penetrate its ranks. And then you have to go after them. Defense One: But you agree that the distrust between Maliki’s Shiite dominated government and the Sunni minority is the root cause behind much of the sectarian tension? Crocker: Once the United States helps get the level of violence down, we will be in a better position diplomatically to say to Maliki, “Look, this situation got this bad in part because al Qaeda is preying on existing tensions among sectarian groups. So let’s sit down and work through those issues.” U.S. diplomats may have to deal with individual Sunni leaders separately, and we’ll have to make it up as we go along. But we have to get back to the role of mediator that the United States used to play in Iraq. Because absent such U.S. engagement, it will be difficult for Iraq’s various factions to make the concessions necessary to break the current impasse. Defense One: Instead of concessions to the Sunni minority, however, Maliki’s administration has charged senior Sunni officials with murder and terrorism. When Sunni anger erupted in protests in April, Iraqi Security Forces stormed the protest camp and killed scores of people. 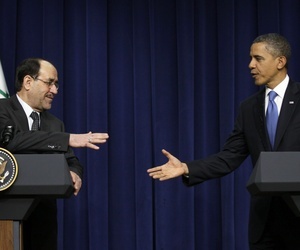 Given that record, why do you think Maliki is capable of concessions to the Sunnis? Crocker: Well, after that violent clash between Iraqi Security Forces and protesters I think all sides took a deep breath, not wanting to return to the bad old days of 2006-7. Maliki started to reach out and engage some Sunni protest leaders, and to publicly make distinctions between legitimate protests and terrorism. For their part, the protesters lowered the tone of their rhetoric a bit. But I still believe that without a trusted third party involved in the negotiations, it will be hard for the Iraqis to make the concessions necessary to maintain a stable, pluralistic society. That’s a role the United States played in the past, and it was time-consuming, frustrating and the results were often uneven. But it’s an absolutely necessary role that only the United States can play. Defense One: Why can’t Iraqis solve their own internal problems at this point? Crocker: Because of history. Remember, Maliki and many other senior government officials came from Shiite parties that were brutalized during the reign of Saddam Hussein, who turned such suppression into an art form. As a result they have a zero-sum mindset that focuses on trying to consolidate power. That history has made all of Iraq’s sects deeply suspicious of each other. The Shiites don’t trust the Sunnis, and neither of them trust the Kurds, who themselves don’t trust anyone. Defense One: That distrust keeps Maliki from reaching out to Sunnis to stabilize his government? Crocker: More than anything else, I think that Maliki is still motivated by fear. Fear of the past, and fear that in the future Shiites will once again feel the boot of the Sunni Baathists on their necks. Maliki lived that history. He was forced into exile. He used to quote that history to me chapter and verse. I asked, once, why he insisted on forming Special Operations units whose commanders reported directly to his office, rather than to the Ministries of Defense or Interior. And Maliki told me that unit was an insurance policy against his being deposed in a military coup like so many of his predecessors. Given what they have all suffered and lived through, senior Iraqi officials find it very hard to think in terms of compromise or concessions. In their experience, compromise equates to weakness and weakness equals death. Defense One: Do you think Maliki is in league with Shiite Iran, as many of his Sunni critics charge, and that is why he allows Iranian flights carrying arms to Syria to pass over Iraqi airspace? Crocker: There is a popular misconception in the West that because Iraq is run by a Shiite-led government, next door to Shiite-majority Iran, then there must be a client-patron relationship between the two states. That overlooks both recent and ancient history. At one time the Iraq-Iran border designated the end of the Ottoman Empire. More recently that border was the front in an incredibly brutal, eight-year war between Iraq and Iran in the 1980s. The bitter feelings that war produced in both Iraqi Arabs and Iranian Persians are acute even today. Maliki is an Iraqi Arab nationalist to his core. He’ll make whatever deals he feels are necessary, with whomever he has to make them. 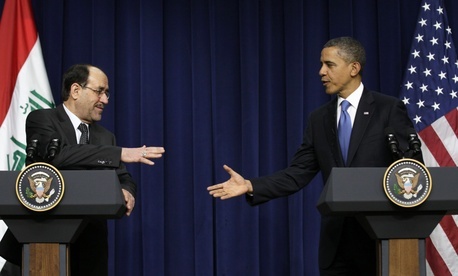 But Maliki is no great fan of the Iranians. Defense One: Given the circumstances, the U.S. diplomacy you advocate sounds like a pretty thankless task. Crocker: You have to constantly play the role of mediator and cajoler, and to tell some hard truths. Even occasionally to threaten. While the Iraqis can rarely give in to each other in terms of concessions, we found that they can give in to U.S. officials. I spent a lot of my time running around between Shiite, Sunni and Kurdish officials getting agreement on proposed concessions. That kind of engagement helped push Iraqi away from the brink. But I don’t sense the political will in the Obama administration for that kind of effort. President Obama just doesn’t engage with Iraq. We’ll see after today’s meeting if that has changed. Defense One: Do you think that’s because he ran in 2008 on pulling the United States out of Iraq? Crocker: That’s my best read of the situation. He saw getting the United States out of Iraq as his mandate, and he adopted an attitude that we gave them their chance at democracy, and now it’s up to them to decide what to make of the opportunity. In disengaging from Iraq, President Obama also obviously reflects the prevailing mood on Capitol Hill and among the American public. But I can tell you as someone who spent a lot of time in that region that a strategy of U.S. disengagement is very dangerous. You may think Syria is pretty bad right now, but believe me, it can get a lot worse if the Islamic State of Iraq and Syria is successful in spreading that sectarian war to Iraq. We could very well have the whole Middle East blow up in our face.